On Sunday my summer travels start, though close to home. I will be visiting some six countries for work between now and September with around 15 flights (My Carbon offset costs are going to be painful!) but to start off I'll be heading to the Hard Probes conference in nearby La Toxa, with a lot of great researchers in the field of heavy ion physics and AdS/CFT applications thereof. Should be fun! I'll give a full run down of the plans when some things have been finalised. Anyway, for now having spent the day in the office debugging, I went for a run and almost did some debugging of the size 13 kind! This little fella was in my path, almost got squished, and begged to be taken back for some snap shots....quite a beast. The hand is that of Zach, one of my current couchsurfers. 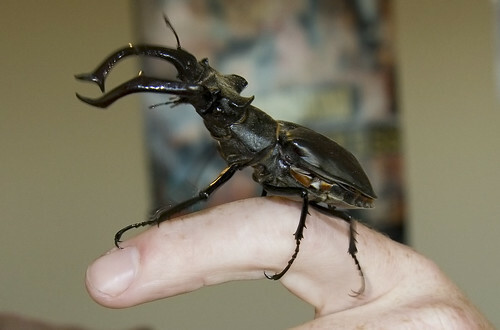 lucanus cervus, Vacaloura in Spanish thanks to Juanito. Weird, I saw a bronze work by Dali today and it looked just like the bug in the photo.